Soul to Soul Connection and Communication is a compelling and uplifting piece for now and the ages. The hand-dome offers profound insights to not only understand how we each respond to life, but it is especially beneficial to understanding and appreciating individuals from diverse backgrounds. This book is a comprehensive and enlightening resource for academic leaders and educators who value diversity and inclusive approaches to connecting with and engaging learners. It is written in such eloquent and powerful prose. Thank you for sharing your voice and wisdom with the world. As a physician, I deal with different people every day, and I need to make authentic connections with all types of people. Your book changed my life. The hand-dome showed me that all people think differently, and understanding that is the first step to any authentic connection. “Namaste” is an ancient Sanskrit salutation that means “the divine in me greets the divine in you.” Ruth describes this state of encounter from the consciousness of our Divine nature as “source-connection” with self and others. This connection affects our everyday transactions and conscious behavior, affecting more peace, joy, and love. Equally important, she shows how to enter into this source-connected state through simple, easy, conscious practices. This creates a platform for authentic, genuine connections. Ruth Forman’s book is right on in highlighting the issues the United States continues to grapple with: prejudice, racism, and injustice toward people from minority cultures. Her book stuns, awakens, and offers uplifting insights and tools that can help us to work together to resolve the issues at hand and promote justice for all. This wonderful book encapsulates almost everything one needs to focus more on how to listen compassionately, connect positively, and communicate effectively with others . . . and understand other cultures’ verbal and nonverbal styles. The insights of the hand-dome are especially beneficial. I look to the book as a life’s guide to make me a better person, woman, wife, and mother every day. 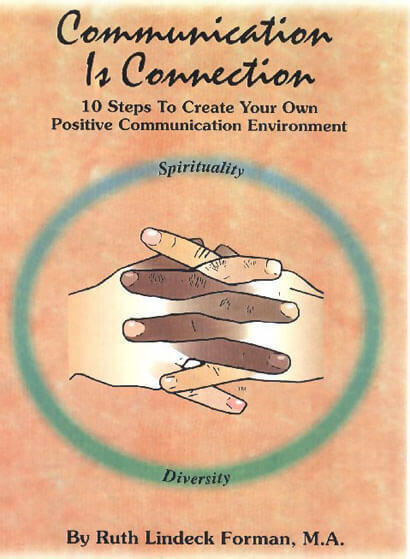 Soul to Soul Connection and Communication is inspirational and motivational as it provides exceptional insight to issues, such as personal development and racism, all affecting society in the modern age. The recollection of the author’s personal experiences as well as detailed historic events elevate the relationship of the narrative writing to the reader. I feel spiritually enlightened with a newer perspective of connecting our current events to the importance of our actions and words. This book is a must-read for anyone who is looking to implement personal and spiritual growth, and contribute to positive change in both their social and private life. Love, growth, communication, and positive change is key in creating a united and strong community of self-aware individuals! Student of Religious Studies, B.A. Business Management, B.S. A wonderful book on common sense for living a full and happy life and leading a successful business. This brilliant piece of work by Ruth Forman, once understood and applied, will aid in creating a harmonious work environment that would produce not only excellent work, but also content people and by extension uplift our society. This book illustrates how powerful simple values and manners can enrich the mind, body, and soul. 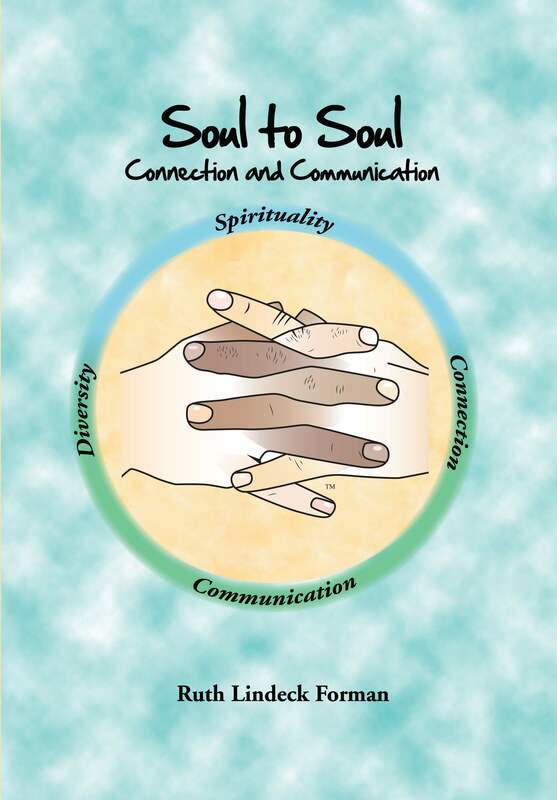 The book Soul to Soul Connection and Communication is such a valuable resource and an invaluable tool for people of all ages. I am an 82-year-old senior, and I see segments of the book that I would love to share with my teenage grandchildren, as well as my siblings and my friends. It will be a gift to anyone who takes the time to read it. Your kind words of affirmation have fueled my passion for fiercely supporting transgender individuals. You are, and continue to be, a truly inspirational storyteller. This book has the most honest, down-to-earth information on communication that I have read. It transcends all barriers and encouraged me to walk the talk. This book is a must for everyone! This enlightening book is an outstanding training and teaching guide and resource. As a mentor teacher for the Los Angeles County Office of Education, I use this book for role playing and group work activities with teachers, principals and administrators. They have responded with such enthusiasm that they are adopting it in their language arts, effective education and multicultural curriculums. It is also a useful tool for conflict resolution especially for at-risk and gang prevention/intervention strategies. Medical education has many deficiencies. This book is an excellent remedy for one of them, our inability to communicate and educate ourselves and our patients. Like the wave’s return to the ocean, Ruth Forman’s Communication Is Connection shows us that authentic communication takes place when there is connection to one’s source and when there is no division between one’s thoughts, one’s words and one’s actions. This is an excellent book. ...As a medical center Chief of Audiology and Speech Pathology Service for 26 years, I am keenly aware of the influence that a positive communication environment has on both personal and professional success. All of us, regardless of our cultural backgrounds, can benefit from guidance in enhancing our interactions with others. That is why I find your book so compelling and helpful. Your book is technically accurate, spiritually uplifting and very readable. Successful communication always springs from your own source—your soul. To the extent the individual can enhance and maintain their “source-connection,” life on this planet will become more worthwhile and fulfilling. Communication is the essence of humanness and some thoughtful contemplation on how to make it better is welcome. Thank you for a fine book. As Resort Manager for the Five Diamond Four Seasons Resort Nevis, West Indies, I often referenced Ruth’s book for its cross-cultural content. In fact, I found it to be so helpful, it is now used by many of the local managers and expatriate managers as they strive to improve their cross-cultural skills. The message in your book is important, timely and powerful. Your insights and reflections about why communication can be ineffective are direct and eye-opening. You capably translate the complex mechanics of communication into a language and skill form that anyone who is seriously interested in positive communication can learn and apply in their daily interactions . . . . The inclusion of a spiritual level in this process, spiritual in the most positive and inclusive sense, is evidence that you speak not just from the mind, but from the heart as well, and therein lies the key to the work-balance. History has shown us time and again that conflict, unresolved, often ends in violence, which is no resolution. Your book provides a powerful tool toward rectifying the breakdown of communication, and I hardily recommend this book to those in search of solutions on a personal and global level. If I possessed one book, Communication Is Connection would be my choice as a guide for an enriched existence. This book is chock full of nuggets which are food for our minds and souls. It is a book that I go back to often to recharge my batteries when they need recharging, and it helps me connect myself and my students to the “CREATIVE MAGIC” within each and every one of us. The text has been carefully crafted and purposefully designed for the multicultural reader. It is truly on the “CUTTING EDGE” for human-kind's march into and for the new millennium. Communication Is Connection is an insightful digest of principles and information necessary to people who desire to excel at communicating. I find it fascinating that my formal legal education . . . never focused on your important concepts. Thus I found your material quite relevant for the legal profession. In this changing environment with new partnerships being formed, personal, traditional communication methods are challenged. Transformations in communication style become necessary to being an effective leader. This book helps me critically analyze my traditional methods and develop a strategy for change to improve communication. Your book helps me rediscover myself and provides me with valuable tools to be a more effective communicator.